It’s almost holiday lighting installation time! This year, why not try your hand at some creative holiday decorating? It’s not difficult once you think about how many different types of lights there are, and how many different “twists” on using them there might be. Icicle lights that look like the real thing have become a very popular part of holiday lighting installation for many consumers. Not only do they look pretty; they’re a breeze to install. But don’t just hang these underneath your home’s roof line and call it “creative holiday decorating”! Outdoors, try stringing together multiple strings of icicle lights and spreading them across an expanse of your front porch railing or shrubbery, or wrapping them around front porch columns and/or banisters. Mixing various colors of icicle lights is another option, both outdoors and indoors. Speaking of innovative holiday lighting installation indoors, consider accenting the inside of a large living room window or the top of a door with a sweep of icicle lights, devising window “curtains” made of light strings or weaving icicle lights and garland together to decorate a banister. If you’re like a majority of consumers, the only part rope lights play in your holiday lighting installation plan is as an accent for Christmas trees, outdoor railings, and fences. But, there’s more to it than that! 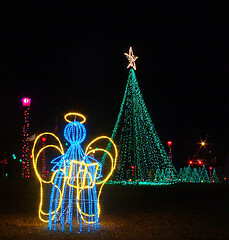 The light PVC material from which rope lights are manufactured makes them very flexible, so try to put together an interesting assortment of ready-made Christmas rope light sculptures. You might also take advantage of the availability of rope lights in a range of colors–green, red and white as well as less traditional shades like blue and pink–to give a distinctive look to your Yuletide décor. And while rope lights can be configured to give off “steady” light, it’s fun–and a good creative holiday decorating practice–to experiment with the various “flashing” effects you can set using a controller. Who says holiday lighting installation has to be limited to landscapes and living rooms? Other rooms benefit just as much from creative holiday decorating based on illumination. Use Christmas lights to line the ceilings in your rooms. Buy and decorate mini-Christmas trees to put in the bedrooms–making them part of a larger holiday vignettes if desired. For added interest, try different bulb shapes. So forget the “same-old, same-old” holiday decorations. With the versatility of today/s lighting options, the sky’s the limit.